I am so excited to be part of the BARE IT ALL blog tour. My post will include an interview, review and giveaway on May 3. Please be sure to join me over at BookTrib. Location: BookTrib - you must sign up for a free account to participate. 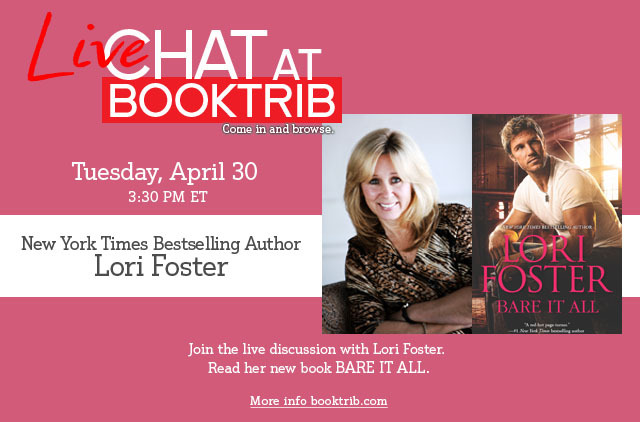 We are kicking off the BARE IT ALL Blog Tour with a bang by hosting a Live Chat with Lori the day before on Tuesday, April 30 at 3:30 p.m. ET on BookTrib.com. Join us to chat live with Lori and find out everything you ever wanted to know about her red hot reads. What’s more— For the FIRST time ever, we will be giving away a goodie bag filled with ALL of Lori Foster’s favorite things. Including, chocolate, lip balm, and more! Along with FREE copies of the book. If you have a website, and you want visitors for that website, a live chat can help you. A live chat for website is very beneficial. If people visit your website, you can convert them to customers with the help of a live chat. Sometimes, when a person visits your website, he may have certain queries or there may be certain specifications which he has not understood, so in this case a live chat with the owner of the website can be of great help.